Our Okanagan Valley ‘Big Lake’ guided fishing charters run year round in the comfort of our heated cabin on board our 22 foot Thunderjet boat. 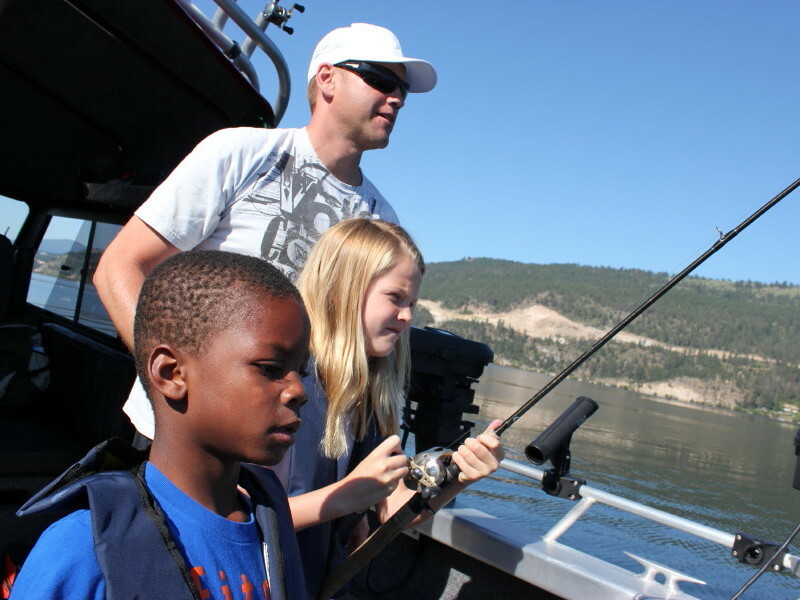 Some of the lakes we fish are Okanagan, Shuswap, Mabel, Kalamalka, Wood, Skaha and Osoyoos to name a few. We are blessed having such an abundance of big water lakes to fish and this allows us to take advantage of the peak seasons each lake has to offer. 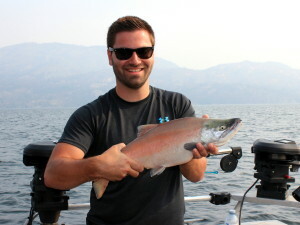 Okanagan lake is home to the largest Rainbow Trout in the Okanagan Valley lakes and is also home to Kokanee Salmon and Burbot. In 2018 we caught many Rainbows over 10 pounds with our largest at just under 15 pounds! Our Kokanee fishery is also good with the best time to target these little Salmon in the months of June, July and August. Last year our largest Kokanee tipped the scales at 4.5 pounds. The style of fishing these large lakes is primarily trolling and we use plugs and a variety of lures and baits. This is a very comfortable sit back and relax style of fishing…that is until the rod goes off screaming! 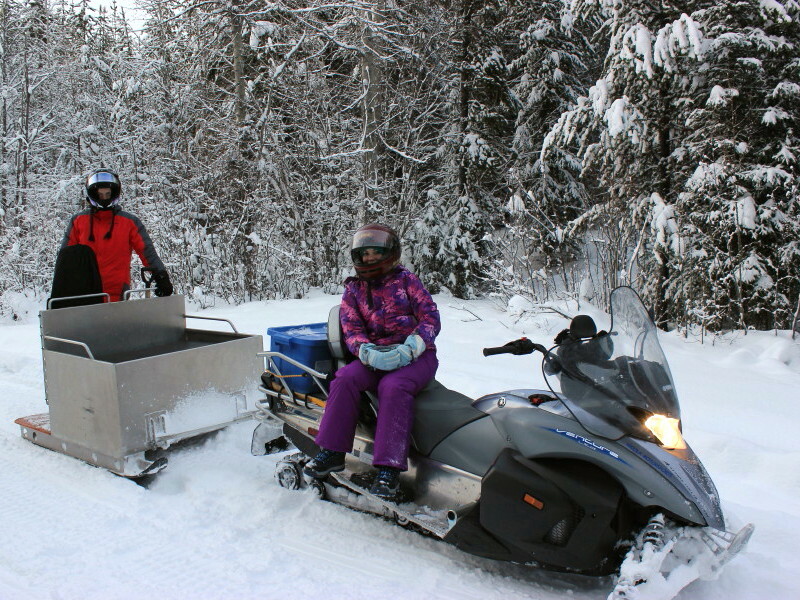 These ‘Big Lake’ type fishing charters are well suited for families with young children. 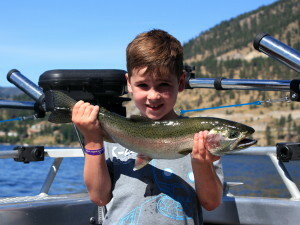 Many of our charters throughout the summer are with young anglers wanting to learn more about the outdoors and fishing. If you are looking to catch a Trophy Rainbow Trout you need to book with us during the months of October, November and December. This is when we consistently catch our larger fish. At this time of year the water temperatures are cooling and the bait fish (Kokanee) are starting to feed nearer the surface. Consequently the Rainbows follow the Kokanee to the surface and we are able to run our lures and Bucktail flys on the surface. Having the Rainbows closer to the surface aggressively feeding and not so “spread out” in the water column allows our lures and flys to been noticed by more fish. Typically our daily catch rates are higher at this time of year. 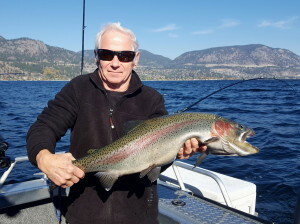 We offer both 1/2 day (4 hours) and full day charters (8 hours) on Okanagan, Wood, Kalamaka, Skaha and Osoyoos lakes. 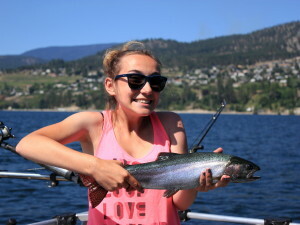 For Shuswap and Mabel lakes we only offer full day charters due to the travel time to these lakes. A fuel surcharge is applied to some of these lakes to help with costs associated with pulling our boat to these lakes. This is noted in the Charters and Rates section of our website. For guided fishing charters on Okanagan lake we depart from the West Kelowna Yacht Club located at 4111 Gellatly Road in West Kelowna. We normally depart at 8 am but can adjust to better accommodate your needs. As well, if you happen to be staying on the lake and would like to be picked up at your dock or resort please let us know and we’ll make the necessary arrangements if possible. A fuel surcharge my be applied dependent on your location. We supply all safety and fishing equipment needed. You are responsible for your fishing licence and your food and drink for the day. A 1 day fishing license for a BC resident costs $10.00 and a “Non Resident” $20.00 for the day. Upon request, we can supply a lunch for you and you will have 2 options, a box lunch or shore lunch. A box lunch consists of a breakfast muffin, custom built sandwich, chips, fresh in season fruit or vegetables and dip, dessert and your choice of water, juice or pop. 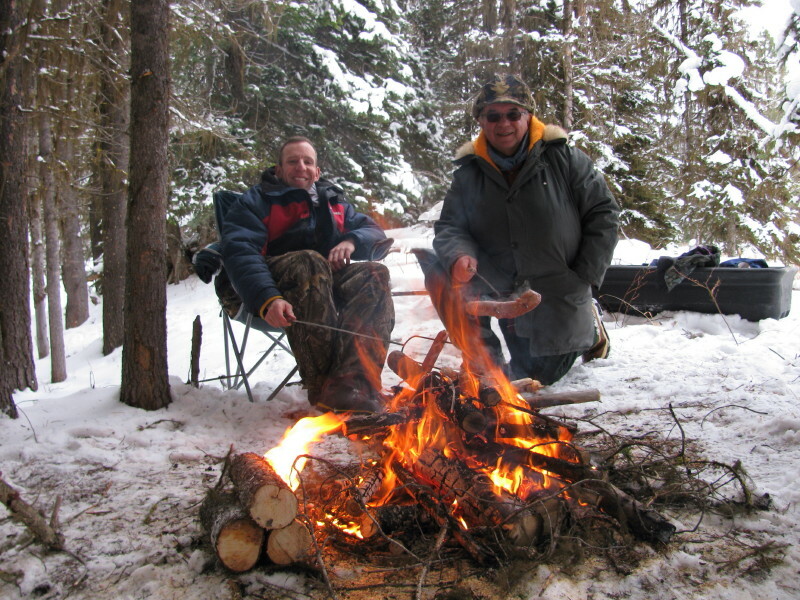 Should you wish to opt for a shore lunch you have the option of roasting smokies over a fire or a traditional fish shore lunch that includes roasted cheesy bacon potatoes, vegetable kabob, baked beans and your fresh caught Rainbow Trout or Kokanee finished with desert. The shorelunch option is only available on full day charters. The box lunch and shore lunch cost is $25.00 per person. Please keep in mind that a shore lunch typically takes about 1-1/2 hours to complete so for those die hard fishermen this usually isn’t an option. Should you wish to keep some fish for the barbecue we will clean and bag them for you at the end of the day.